1. Mix all the ingredients well. You can adjust the amounts slightly to taste, and find out the balance of ingredients you prefer. 2. 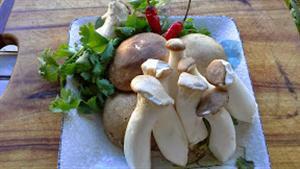 Cook the chopped mushrooms in the toaster oven or oven at 220C for about 15 minutes, or until they are cooked. 3. Mixed the toasted mushrooms with the Taiwanese ginger dressing well. Allow it to set for about 30 minutes, then it's ready to serve. Garnish with some sesame seeds if you like. Submitted by BK (not verified) on Fri, 31/10/2014 - 12:32. What type of vinegar is best to use for this recipe? can we use apple cider vinegar? Submitted by Jodie on Sun, 02/11/2014 - 21:37. Usually for Taiwanese cooking, we use rice vinegar. But apple cider vinegar is also possible.